In my last post on this project I showed you the pictures of the Existing-House_Concrete-Deck-And-Patio-Addition-OseH1-103. The concrete deck as designed allows access to the crawl space from underneath the deck. From the deck we step down to the concrete patio. 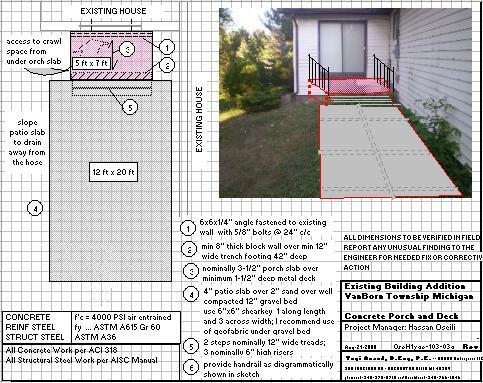 Here is a design sketch of the proposed concrete deck and the patio. If there is anything else of interest, I will keep you posted with the progress as we go along.